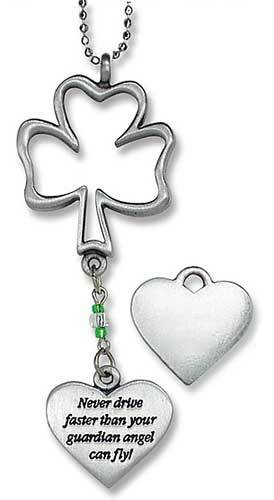 Irish car charm features a pewter shamrock and blessing; it may hang from your rear view mirror. The shamrock car charm with blessing is ready to hang from your rear view mirror with included 8" long chain. The Irish rear view mirror ornament measures 3” long and is gift boxed with a shamrock history card, complements of The Irish Gift House. This pewter Irish car charm may also be used as a key chain.